True confession. I am a chronic over-packer. I come from a long line of chronic over-packers. I have lugged overstuffed, zipper-busting suitcases to several different continents in my lifetime. I have had to unpack and repack suitcases in the airport line. If I think that we might need (or *want* cuz after all in our culture what’s the difference?) an item, it usually makes it in there. In our transition to minimalism, packing has presented my greatest challenge. Being responsible for packing four different people (sorry, honey, you’re on your own!) has only made matters worse. My dream of one load to unpack our car on weekend trips to see my dad has yet to come to fruition. I have definitely improved, but for this international move to Thailand, I have needed all the help I can get. I think that my friends in Thailand probably thought I was a little neurotic when I started asking back in October about which clothes my kids might need there. My way of dealing with new and unknown situations is to be sure I and my family are properly attired. In the last few months, we have donated, traded and sold so many bags of clothing that I felt would not be useful in our new home. Yet, our suitcases and boxes were still stuffed to the brim. When we packed up and moved out of the house, I let Mike go through my clothes and help me downsize again. I thought I had gone as far as I could go, but he found a whole pile of stuff that I didn’t need. Now, after having lived out of those same suitcases for the last three weeks, I realized that I could cut the fat even further, but I was not quite sure where to start. Now I am no fashionista, and for most of my life, my personal style would not be categorized as trendy, but like most women, I like cute clothes and I spend a lot of time, money and energy pursuing just the right look for me. This pursuit tends to create more anxiety than its worth. Especially in the morning, when I look at my closet and I look in the mirror, and I wonder ‘What am I going to put on this body?’ So, it was ever so timely when Joshua Becker at becomingminimalist linked to a post about a young mom’s “capsule wardrobe.” After reading her article and following a link to the un-fancy blog, I was intrigued. I did a few days of research. I filled out the free wardrobe planner on the un-fancy website and read up on color theory here and re-mixable wardrobes here. After my research, I went to work one evening with my hubby as my sounding board, and this is what I came up with. My color scheme includes three dominants: olive green, dark blue, and coral; four neutrals: white, tan, black and gray; and two accents: pink and purple. The idea of a capsule wardrobe is to create a collection of clothes that 1) you enjoy wearing, 2) mix and match with each other so that you can create variety without a lot of clothing, and 3) make sense for your life-style in the here and now. For me, it helped to put my style into a couple of words: sporty, sweet, casual and comfortable (an exercise in the wardrobe planner on unfancy). I am not a dainty body-type, but I gravitate towards styles that are feminine, floral and airy. The solution? Something called “military chic” that kept coming up when I searched color schemes with olive green. This style includes military cut and color outerwear with small floral prints in coordinating colors. And it just so happened that at the last clothing swap I scored a shirt with Hunger Games style neckline in white with tiny olive green flowers. I think seeing that the style had an official name made me a feel a little more confident to rock what I already had in mind. That was what was so cool about this exercise. I did not need to run out and buy anything new to feel good about what I have to wear. 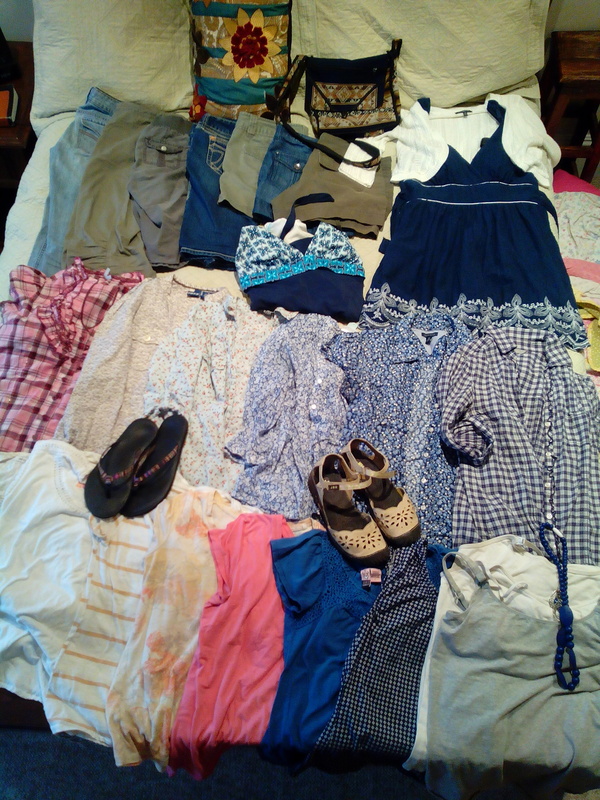 Most of the items came to me for free through our church’s clothing swap or as hand-me-downs from friends and my stylish mom. However, with some ideas from unfancy about layering and putting items together that I hadn’t thought of before, I got more excited about what I already owned. And now when I have the desire for something new or people want to buy me gifts (like for Mother’s Day), I have more direction in what I will actually use (like this super cute diaper bag). I would love to hear if any one else is intrigued and wants to give it a try. Imagine, if we could all walk about comfortable and confident in our clothes and still have money to give to great causes (like this one). These are the items that didn’t make the cut. Cute in their own right, but not cohesive with the entire wardrobe. We will see if I regret letting them go. Shannon, thanks for the inspiration. I too am going through my clothes. Moving from 2,650 sq ft to 850 is causing me to become a minimalist also. Nice to declutter and have less to care for.